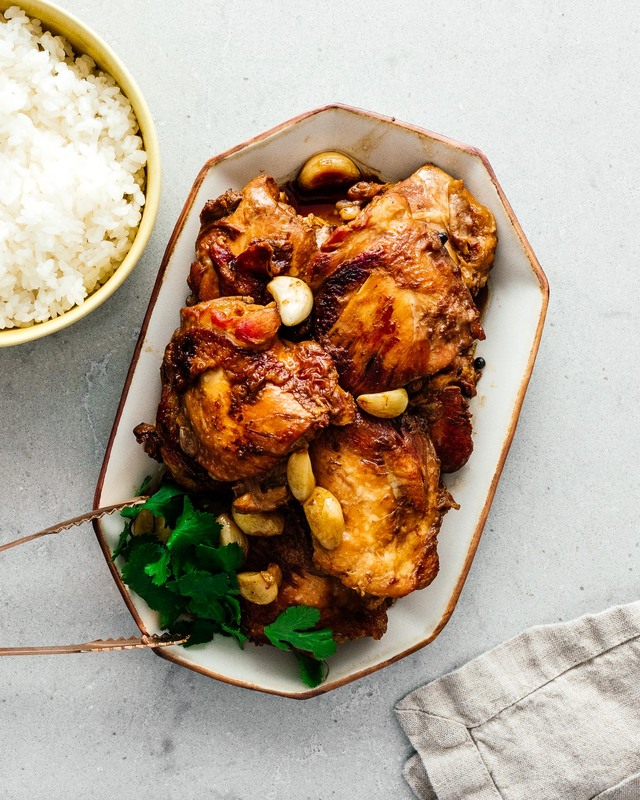 7 Ingredient Easy Chicken Adobo is the answer to your weeknight dinner boredom. Chicken and rice is one of those dishes I absolutely love eating. There’s something so comforting about the combination. Growing up, it was always on the menu: fast, easy, and a no brainer for my mom to make for a weeknight dinner. It was the one thing that I would consistently eat as a child and even now, it’s completely nostalgic for me: true comfort food. It seems like the world agrees with me – every culture has its own version, each one comforting in its own way. It was always the best day of the week when my mom would come home from the Chinese butcher with a Styrofoam box of glistening soy sauce chicken. 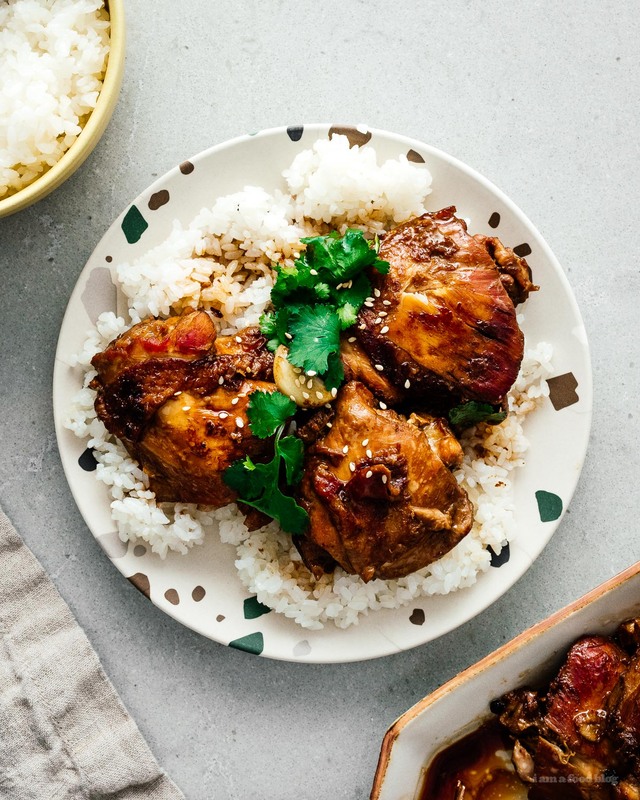 We would make rice in our trusty rice cooker and the taste of the chicken-y soy sauce on fluffy white rice was to me, one of the best flavors of childhood. My other favorite was when my mom would make Hainanese chicken: a simple dish of chicken poached in a flavorful broth seasoned with ginger and garlic. The chicken was unbelievably tender and a perfect match to the extra chicken-y rice that was made by toasting rice in chicken fat before cooking it in chicken broth. So good. Now, when I’m looking for something new and comforting, I look towards chicken rice – I’m forever searching for new iterations. 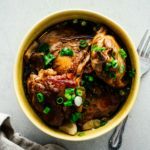 I love the Japanese version, oyakodon: chicken stewed in savory dashi with creamy eggs over a bowl of white rice, creamy chicken casserole, arroz con pollo, and of course Filipino chicken adobo. 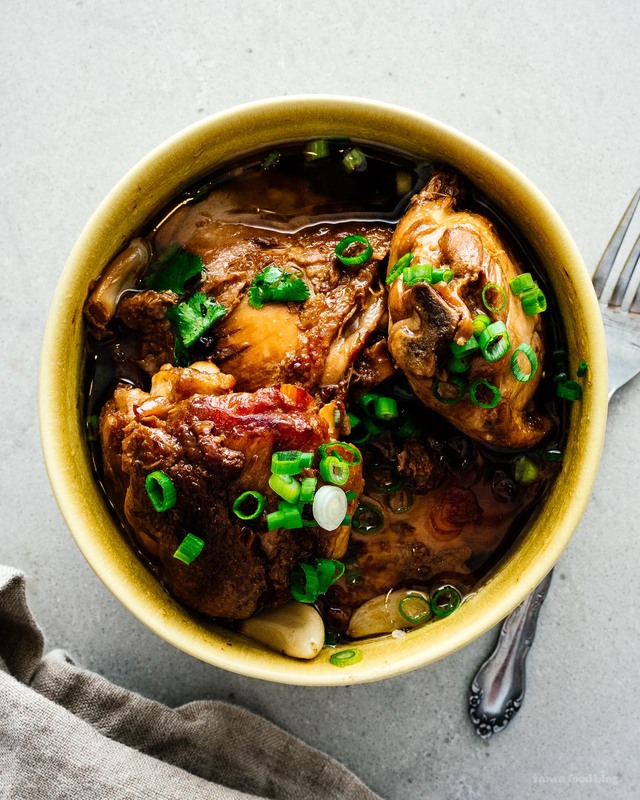 Adobo is the unofficial national dish of the Philippines. It’s garlicky, vinegary, saucy, and addictive. It’s a little confusing because when you think adobo, you might think of Mexican or Spanish food. 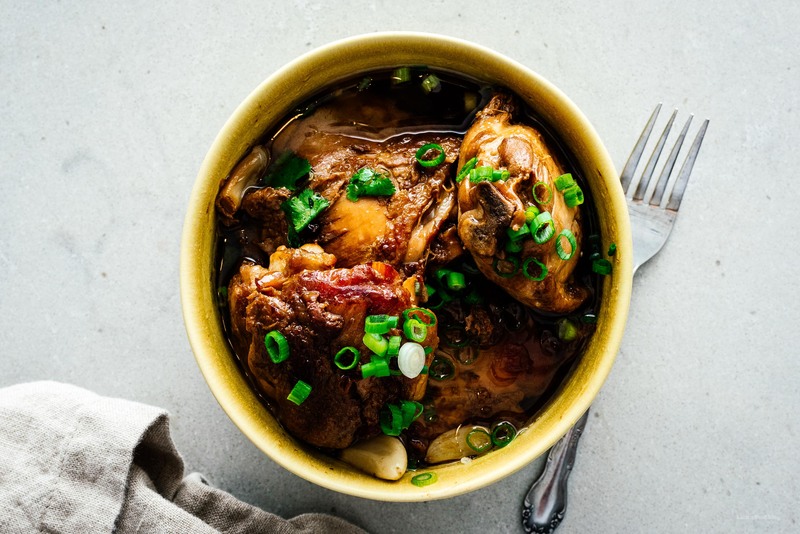 In fact, the word adobo actually means sauce or marinade in Spanish, and in this case, it’s a sauce made of soy and vinegar. 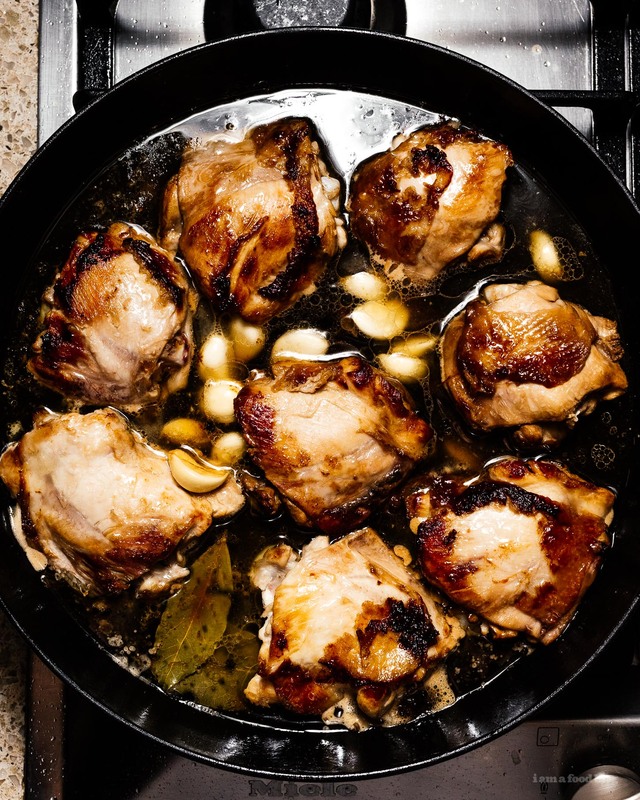 All you need is chicken (preferably skin on bone in chicken thighs), vinegar, soy sauce, garlic, black peppercorns, and bay leaves. Because it’s such a popular dish, these five ingredients change from person to person. Sometimes people add in a bit of sugar or even coconut milk. 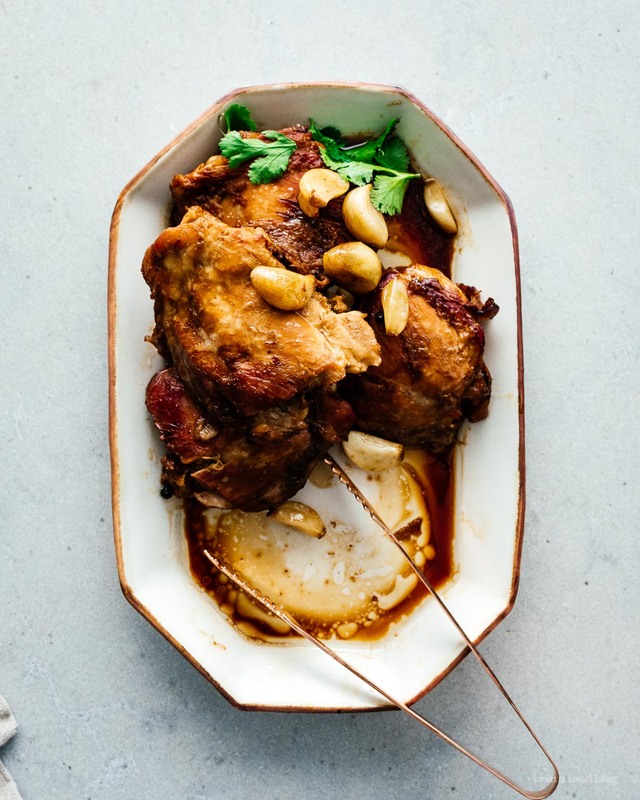 Everyone has their own way of making chicken adobo. Here, we kept it simple, with just seven ingredients. I think it’s the simplicity that makes it taste so good. The fact that so few ingredients can combine together and make it more complex than the sum of its parts is amazing. What are you waiting for, make this tonight and absolutely serve it up with lots of fluffy white rice to soak up all that delicious sauce! 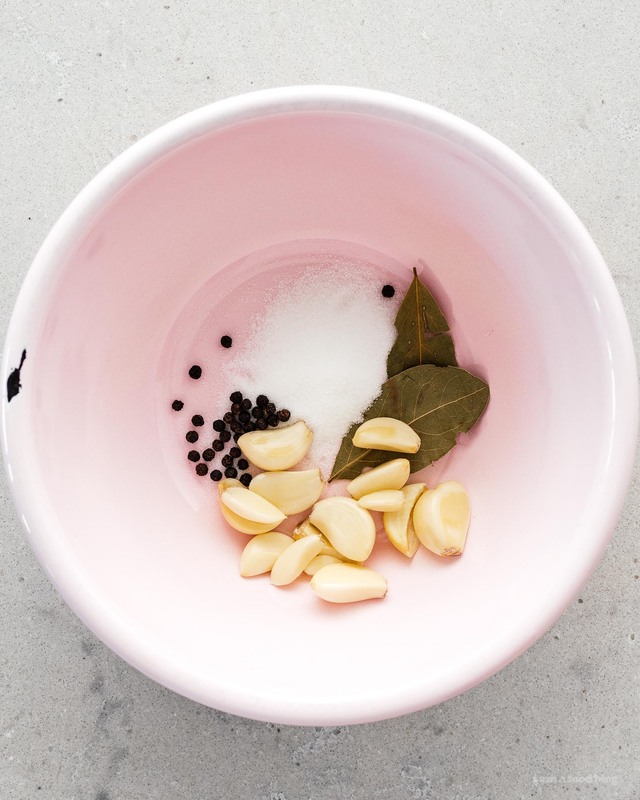 Marinate the chicken in the soy sauce, rice vinegar, sugar, pepper, garlic, and bay leaves for one hour minimum. In a dutch oven, heat up the oil over medium high heat. Brown the chicken skin side down, in batches if needed, then add the marinade. Top with enough water to almost cover. Bring to a boil, then turn to a simmer, and cook uncovered for about an hour. The sauce will be brothy and thin. If desired, remove the chicken and simmer the sauce to thicken. Enjoy with fluffy white rice. Looks great, can’t wait to make it at home!